HomeMaritimeThe Maritime Industry at the Dawn of Digitalisation: Connected & Smart Ships – Hype or Reality? The Maritime Industry at the Dawn of Digitalisation: Connected & Smart Ships – Hype or Reality? Executive Summary – No doubt that digitalisation is considered a hot topic in the maritime industry right now! Today’s trend towards ‘connected & smart shipping’ is focused on the ability to leverage the power of data in a more intelligent and effective way. To gain insight into where the industry is in terms of digitalisation and how ready the maritime community is for the change, we have gone to the next level. 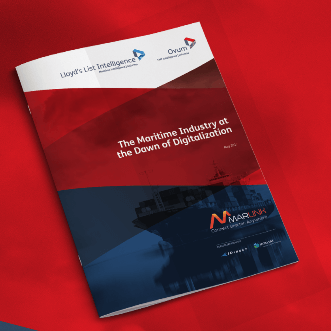 Between February and May 2017, Ovum and Lloyd’s List Intelligence investigated the opinions of decision makers in shipping companies commissionned by Marlink in association with iDirect and Intelsat. The objective was to provide detailed insight into the current adoption of digital technologies by the maritime industry. The survey comprised of 200 interviews, based on a sample of decision makers from shipping companies operating in Europe, Asia and the Americas. Sixty-one percent of the respondents were managers in charge of vessels, 23% were managers in charge of IT and 17% were senior or executive managers involved in strategic decision making. As many as 92% of the interviewees were either budget holders or budget influencers. The Executive Summary will give readers a first insight into the key findings of the survey – prior to the publication of the final whitepaper. The full whitepaper will provide more details per types of shipping company, size of company, geography and decision maker profile, as well as revealing details about how anticipated investments into on board spending will compare with current levels.